I happened upon these sweet charms lately, and simply couldn't resist making them up into some fun jewelry. While there is no sculpting or polymer clay in these pieces, I thought that the owl and bird themed charms might appeal to some of you! There is also a lovely Koi fish necklace & earring set that has semiprecious stones, including mossy agate. All pieces are being auctioned on eBay, ending on Monday. 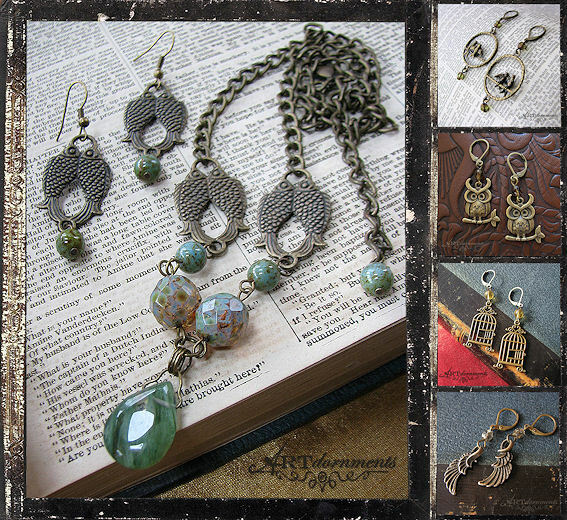 GHOSTLY GOODIES & NEWS ABOUT MY NEW JEWELRY! With Halloween almost here, I thought that this was the perfect time to share some of my "Opera Ghost"/Phantom of the Opera themed jewelry! There are several Phantom face necklaces, a pair of spooky skull earrings, and two very special beaded necklace sets that are all on auction until Tuesday. 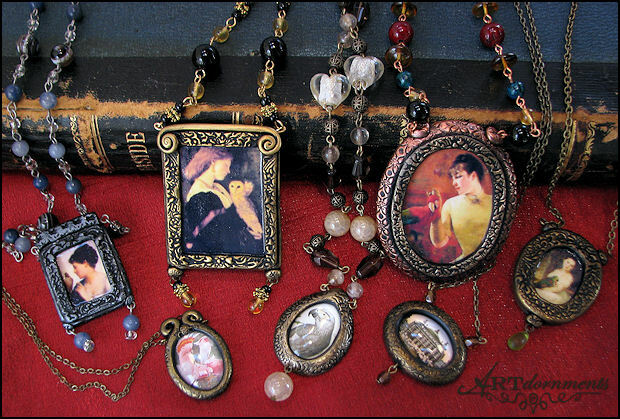 These two beaded necklaces (at the top of the photo here) feature images of my sculptures under glass, with handsculpted antique-looking clay frames, and individually linked glass beads. These two necklaces will give you a little taste of the style of the new line of jewelry that I've been working on! I'm incredibly excited about the new upcoming line of jewelry, and am busily working to have it ready to debut by the end of the month! So if all goes well, you can expect a newsletter in the next 3-4 weeks, with all of the details, and about half a dozen special new one-of-a-kind necklace sets! New on auction are an assortment of jewelry including some gorgeous earrings with feathers donated by my female Eclectus! There is also an African Grey necklace with removable charm, a "bird poop" necklace, and another colorful "scrap clay" bird necklace. ALL of this month's auctions are only going for FIVE DAYS, and end on Thursday. The plan for December was to have both male and female Eclectus for the Bird of the Month, but the rush of Christmas orders cut me short on time, so it's just the males! Watch for females in February! In this collection, there is a male Eclectus bracelet charm, necklace charm, charm on a cord necklace, beaded bracelet, and a beaded necklace and earring set. The auctions are up until Thursday night on ebay.